I frantically whispered to one of the ushers last Christmas Eve. Each year, our parish invites two or three children to carry small figures of Mary, Joseph, and baby in the opening procession and complete the nativity that we had begun “building” since the first Sunday of Advent. Amidst the exhilaration of the night and unopened presents under the tree, one of the kiddos had forgotten to grab Joseph. It wasn’t until I brought up the end of the procession that I noticed Joseph had been left behind. As I considered my already full hands, I wondered if anyone would even notice if he didn’t resume his traditional place next to Mary. The usher, however, looked at me with a measure of horror and disbelief. Finagling my hymnal, I grabbed Joseph, tucked him under my arm and hoped nobody would notice his head and legs jutting from my armpit. Whether anyone in the congregation did in fact notice or care that night I’ll never know. In the end, Joseph took his rightful place in the crowded display, and the glory of the brass and congregation singing “O come all ye faithful” outweighed any semblance of disorder. In the nativity drama his role can seem miniscule. After his son’s birth, he nearly disappears from all four Gospels save for a brief cameo as an anguished dad searching the temple for his now-precocious son. 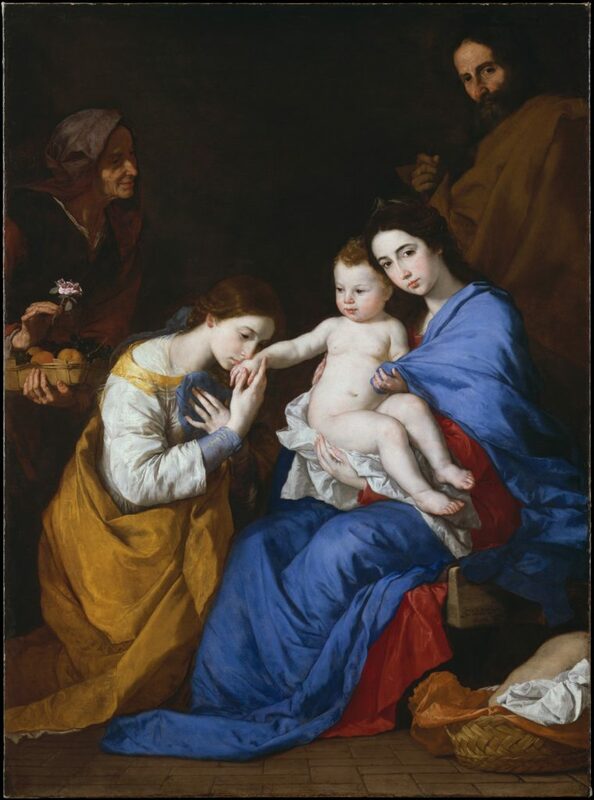 Joseph stuck in the shadows while Saints Anne and Catherine of Alexandria greet his son. 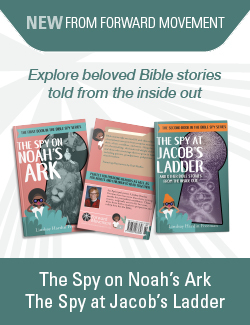 Yet, there is so much more to Joseph than the white and blue tunic from my kids’ bible. Yet, in my achievement-oriented mind, I tend to overlook the tenacity and faithfulness of Joseph’s attention to the present, the ordinary, the here-and-now. This is the Joseph with cracked heels, tired feet, and a back worn down by miles of pedestrian travel. He will not stop until Mary can deliver in relative safety. This is the Joseph with the worry lines etched into his forehead as he considers the implications of his fiancé’s impending labor. He could leave and save his reputation, pride, and safety—but, he won’t. This is the Joseph who says yes to God knowing his response will likely render him an anathema in his community. He still says yes. And, this is the Joseph who takes the risk of loving someone whose future he can’t pin down. He lets love make him do the impossible. To a calling lived not in the spotlight, but behind the scenes. But above all, to Love. Perhaps instead of focusing on how things appear and what is beyond our control (I know, it’s soooo hard), we can go forth this day on the Feast of Saint Joseph — even this whole week — and say ‘yes.’ We can say yes whenever fear wants to say no, pride wants to maintain the status quo, and exhaustion leads us to wonder if our efforts and life are all for naught.